Do you offer Stag & Hen parties? Do you offer a discounted rates for Scout, Guide or Youth Groups? We love a Stag and Hen party, and we offer just the right blend of laughter and ritual humiliation to start your evening off with a bang! Please note: Tickets must be booked up to 7 days in advance of your visit date so that we can get in touch with you to make the experience truly personalised. If you have any questions about our Stag or Hen packages, please email Edinburgh.Dungeon@merlinentertainments.biz with the subject line: Hen/Stag Package. Please note, guests must not be under the influence of alcohol or any other substance. Those that are will be removed from the attraction immediately without a refund. 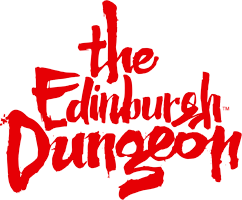 The Edinburgh Dungeon comprises of an actor led tour through Edinburgh's darkest history and therefore includes theatrical performance. The safety of our staff and guests is paramount and we therefore do not tolerate any form of physical or verbal abuse of any nature. How long will I be in the Edinburgh Dungeon? Do you offer Birthday Party packages at The Edinburgh Dungeon? Is my 2 for 1 voucher valid at The Edinburgh Dungeon?